DETROIT — MISO expects the use of technologies such as energy storage, synchrophasors and HVDC lines to increase, Executive Vice President of Transmission and Technology Clair Moeller told the Board of Directors at its System Planning Committee meeting last week. Board member Michael Evans asked if MISO could commission a technology company “that’s already slogging through the big data” to analyze the RTO’s information. MISO has found that DC transmission, which is ideal for transporting large amounts of power over long distances, only becomes as cost effective as AC for lines longer than 600 miles. Moeller said DC technology could connect MISO resources to ERCOT and the Western Interconnection. “If there are technologies available to us to move power from Denver to Des Moines, direct current is the way to go,” he said. 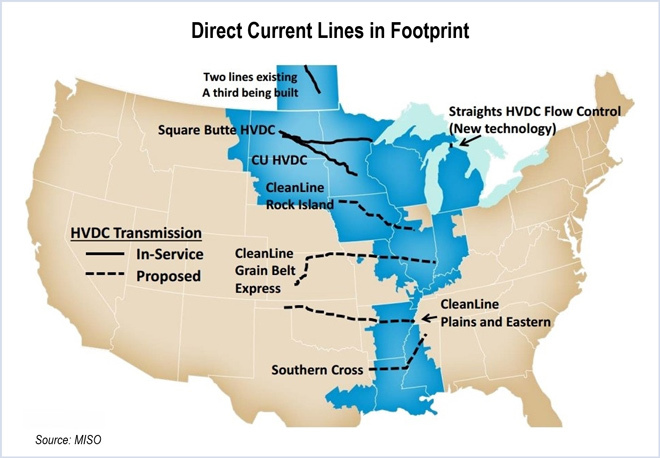 Clean Line Energy is MISO’s largest DC merchant, with three interconnection projects in the queue: the Grain Belt Express (which could carry 4,000 MW of wind power from western Kansas to Missouri, Illinois and Indiana), the Rock Island line (3,500 MW of capacity from northwest Iowa to Illinois) and the Plains & Eastern line (4,000 MW of capacity from the Oklahoma Panhandle to Tennessee and Arkansas). The Plains & Eastern project faces opposition from Arkansas’ congressional delegation. (See House Panel OKs Bill Targeting Clean Line Project.) MISO has just three DC lines to date: one in Manitoba and two transferring power from North Dakota into Minnesota. “They’re substantially faster and more flexible,” Moeller said. MISO’s treatment of battery storage as generation will have to change, Moeller said. It cannot be “force fitted” into a generation market definition, he said. Although energy storage is evolving rapidly, and utilities are beginning to experiment with it, it is not yet competitive in MISO, Moeller said. He said there is no an independent source that has identified when storage will become economically viable. Moeller also said MISO believes storage’s competitiveness has been hurt by the low cost of gas. While storage technology becomes cheaper and MISO shifts from its dependence on coal, Moeller said the RTO has discussed strategies to more precisely model price volatility, including securing grants for Ph.D.s in university mathematics departments for a more complex algorithm for gas prices and renewables. MISO currently uses U.S. Department of Energy data and simple inflation to forecast gas prices. MISO Vice President of System Planning and Seams Coordination Jennifer Curran said the RTO expects installed gas capacity to increase in the near future, with 2,700 MW of gas-fired generation projects in advanced stages of study in the generator interconnection queue. By 2030, MISO expects gas penetration to reach 35%, almost equal to coal’s current 36% share. 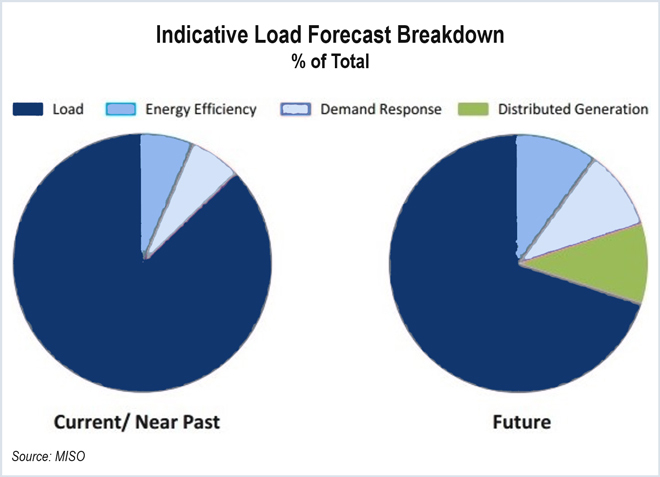 MISO said the substantial shifts in generation mix is justification for the RTO to begin making its own independent load forecasts. A panel of experts shared its views on distributed generation, resource adequacy and aging infrastructure during a stakeholder panel at MISO’s Annual Meeting. FERC Chairman Norman Bay joined the MISO Board of Directors in its discussion of Clean Power Plan modeling.